Scoliosis is a condition that occurs when there is an abnormal curvature of the spine. Left untreated, this can cause a number of problems through the years, including pain and imbalanced muscles, and may even cause permanent disfigurement and damage to the internal organs. The health professionals at Longmont Spine & Physical Medicine offer a number of services to assist patients with scoliosis management. 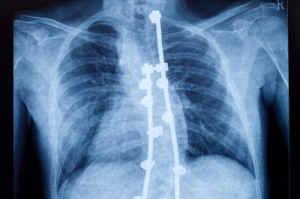 While some cases of scoliosis are relatively minor, everyone affected by this condition of the spine can benefit from personalized treatment options. To determine the plan that is right for you, our doctor will first perform a physical exam to evaluate your spine and run diagnostic testing, if necessary. To ensure that you continue to receive benefits—even when you aren’t in our office—our doctor will also devise a scoliosis management plan that can be worked on at home. Scoliosis is a very manageable condition. For more information on how the team at Longmont Spine & Physical Medicine can help with your scoliosis management program, please call (303) 816-3853 now to schedule a time for your free consultation.